Kholaf is 71 years old and has a very large family. Of his 12 kids, two were killed by ISIS during the capture of the Sinjar region, event that forced the family to escape to the north of Kurdistan. Kohlaf normally still lives in Sinjar with some of his kids. Indeed, his family is one of the few that still owns a house in Sinjar. However, as the gas station they used to own is now destroyed, they currently have no income. In addition, healthcare services are often unavailable in Sinjar. Accordingly, Kholaf had to move to Khanke, a large IDPs camp near Duhok, because he needs a heart surgery. Now he leaves with three of his sons and their new families together in one tent. The conditions in Khanke are harsh and he should be operated as soon as possible. To allow this, the family has indebted itself to pay the surgery (2000$) and the transport to the hospital. However, due to Kholaf’s hypertensive state, the surgery has been postponed. Now the old man is forced to stay longer in Khanke and pay the transport once again. 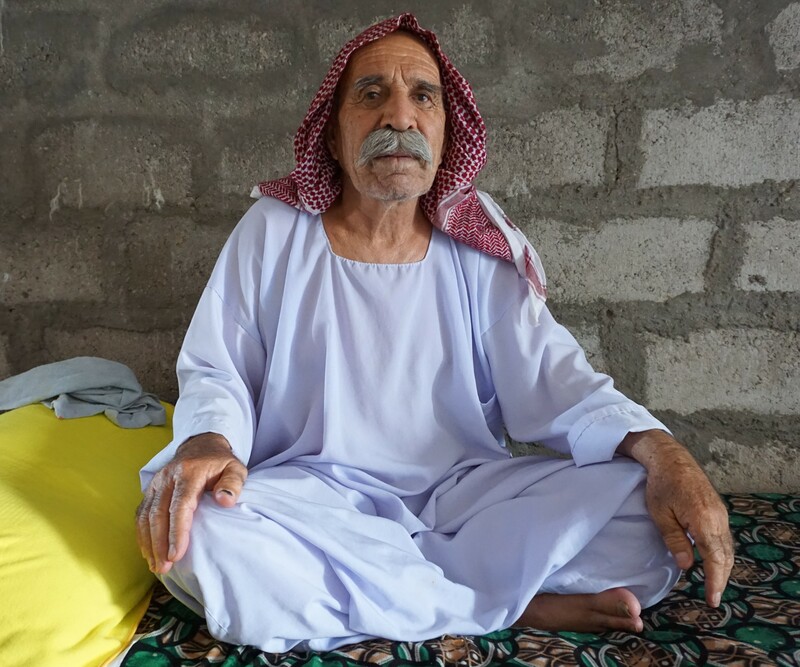 His relatives still counts on Kholaf as the pillar of the family structure and his grandchildren all gather respectfully around him to listen the story of their escape from ISIS through the SInjar mountains in 2014. We decided to help Kholaf’s family by contributing to the price of his surgery. So thanks to the French Association for the Aid of Youths with Disabilities and People with Handicaps (Association pour l’Aide aux Jeunes Infirmes et aux Personnes handicapées) we managed to provide him with this essential service and now Kholaf can live healthy longer.